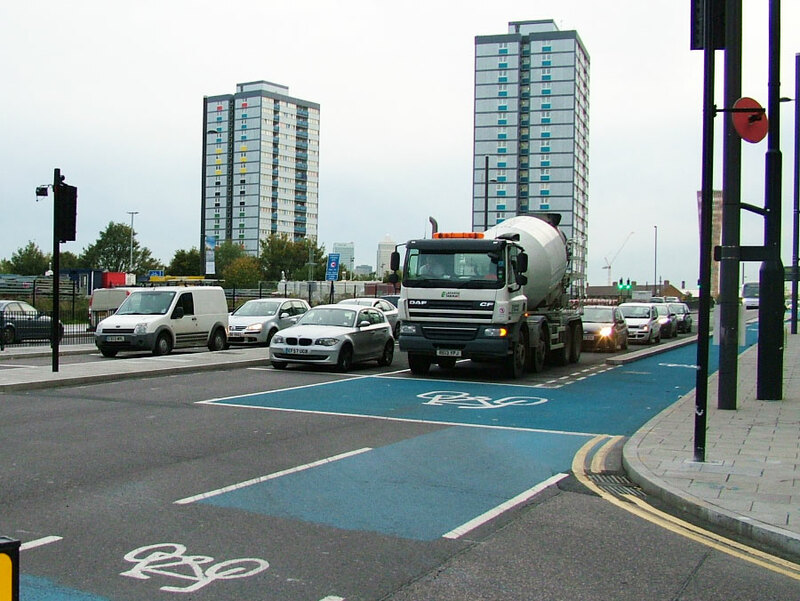 This is the second in a pair of articles about the new section of Cycle Superhighway 2 from Bow roundabout to Stratford. You can read the first part here. In the previous article on this subject I stated that the length of the segregated “Superhighway” was one mile, not the two miles claimed by TfL. Since then I have done some further measurements (by drawing a line on Google Maps) and found that it is in fact even shorter than that. The new CS2 cycle track is 0.7 miles (1.1km) long on the eastbound side, and 0.8 miles (1.2km) long on the westbound side. But as much as I bleat about it here, the damage is done. All the news sites have reported it as being two miles long, so hype has won out over substance again, and that’s the main thing for Mayor Johnson and his PR man cycling czar Andrew Gilligan. But while two miles might sound like a long way, it’s a drop in the ocean. Let’s do some back-of-an-envelope maths. TfL controls 360 miles of road in London all of which are wide, busy and hostile to cycling. Stratford High Street is actually controlled by Newham council, but let’s be generous to TfL and pretend that it is one of theirs. The new segregated bit of CS2 makes up 0.2% of TfL’s road network. So it’s taken five and a half years since Boris Johnson became Mayor of London to get half-baked cycle paths on just 0.2% of London’s busiest roads. Given this rate of progress, it will take 2750 years for all of TfL’s roads to get cycle paths. I estimate that TfL-controlled roads make up roughly ⅓ of London’s ‘main’ roads, so the CS2 extension covers around 0.07% of them, and it would take over 7000 years for all of the main roads in London to become safe and inviting for cycling. I can’t wait! Moving on to the next weak point, we arrive at a large signalled junction. 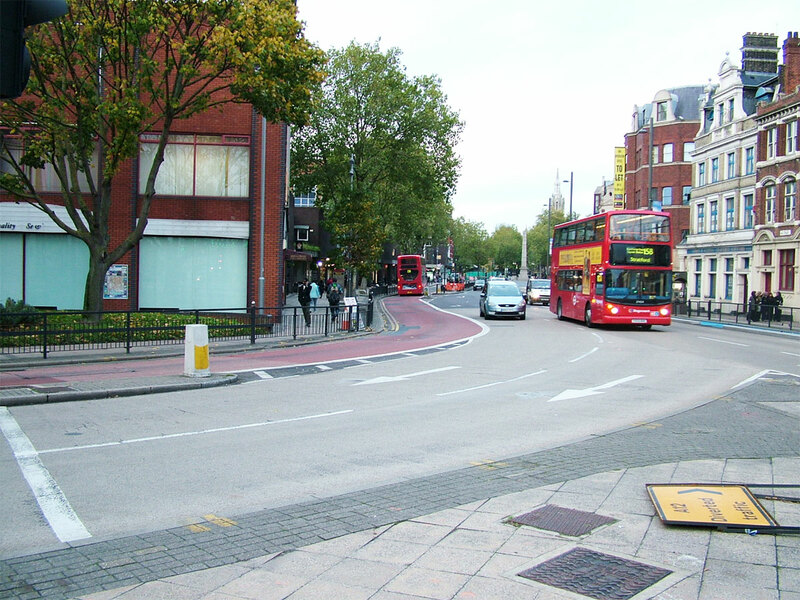 This is the junction shown in TfL’s laughably awful instructional video on how to make right turns. 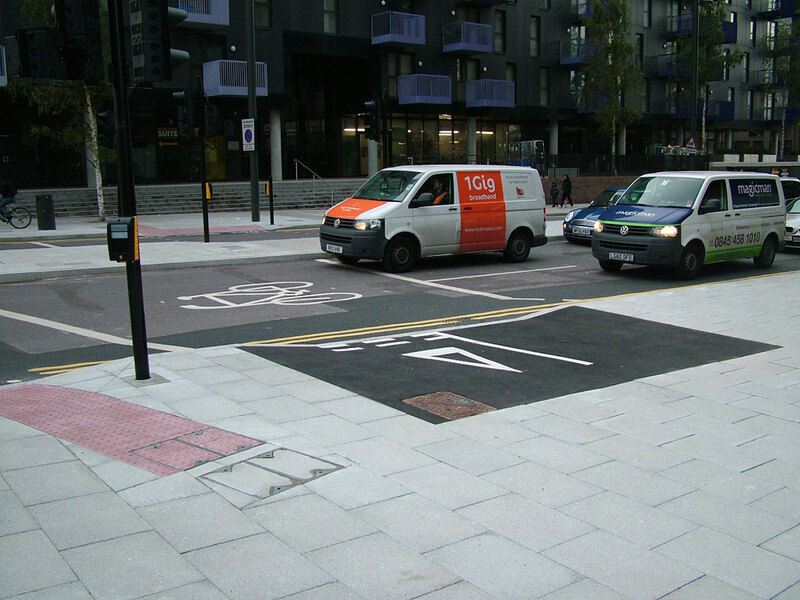 The first thing you’ll notice is that the protecting kerb stops before the junction, and the demarcation continues as painted lines, handy for left-turning drivers to keep their speed up as they cut across the bike lane. Further on, the cycle lane widens to create an ASZ in front of the nearside lane. Mysterious bike box and speedy left-hook set up. You can’t use it to turn right, only for going straight on or left. So what’s that ASZ for? What purpose does it hold? You may also notice that there are no separate traffic lights for bikes. This means that left-turning drivers and straight-on cyclists get a green light at the same time. This is a recipe for disaster. It is already causing conflict. This cement mixer is turning left. Would you want your children cycling here? Do you trust all drivers to give way to cyclists riding straight on here? Again, this is a very fast road with lots of traffic. Plenty of vehicles turn left here, including buses. And again, there is pressure on drivers to keep the main carriageway clear. If the light is green then it must be uncomfortable waiting in the road to turn left, knowing that speeding vehicles are coming over the hill behind you. That’s no excuse to bully through, but it is another example of designed-in conflict. 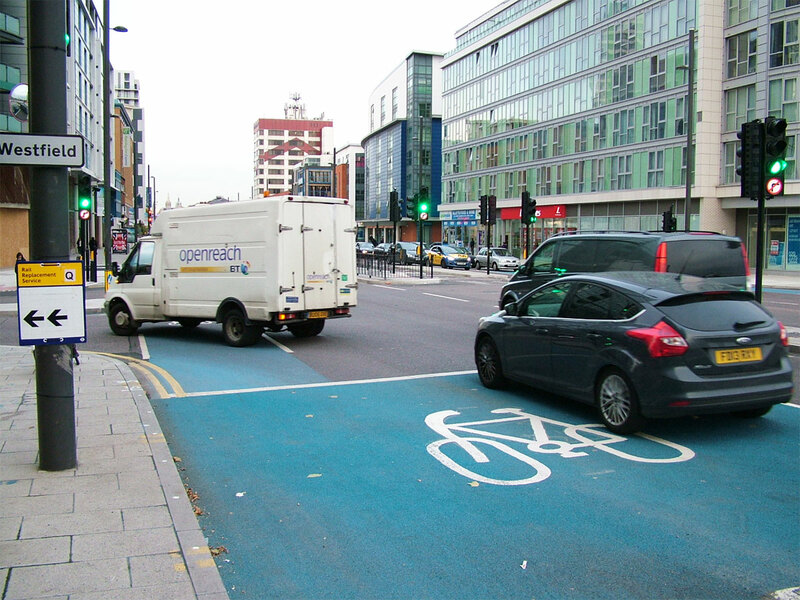 Why haven’t TfL separated cycling from motoring in time at this junction? It does look a bit like a pair of pants, doesn’t it? I call it ‘the pants junction’ because it looks like a pair of boxer shorts, albeit with a very tight crotch. It even has a fancy logo on the left leg! If you’re lucky enough to find the ASZ free of motor vehicles, the idea is that you can then wait at the lights to go straight on, completing your right turn. One odd thing is that you can complete the right turn in any number of other ways. Testosterone-filled thrill-seekers can pull across into the outside lane on the main road, turning right in the traditional manner. The footpath all the way along Stratford High Street/CS2 is shared use, meaning it’s legal to cycle on the footpath. The crossings are all toucan crossings (for cycling and walking). I get the impression that TfL didn’t really know what to do here, so they just threw everything that they could think of into the mix and crossed their fingers. There are even ‘Trixi’ mirrors, the cherry on this cake of kludges. 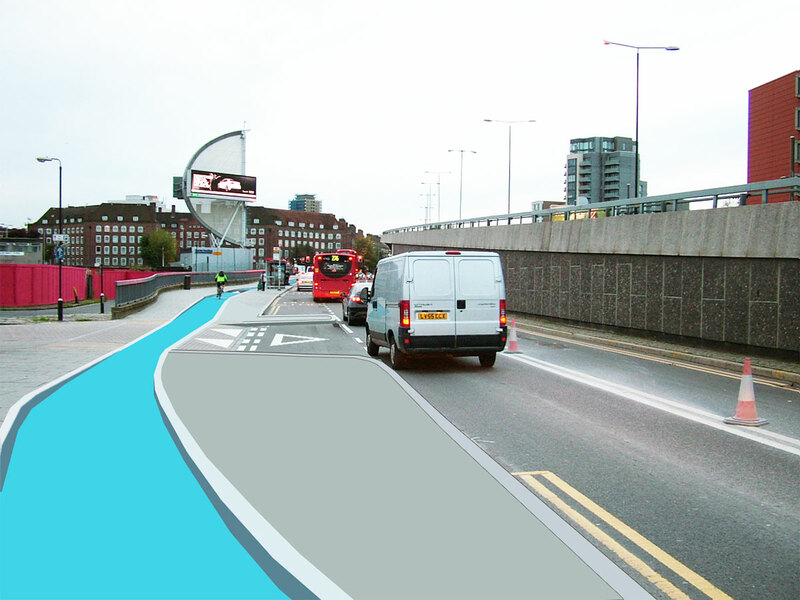 The pants arrangement above also enables those cycling from that side road to turn onto CS2 while the traffic lights are red, by turning sharply left across the footpath via the tarmac dropped kerb. The concept of a “turn left on red” for bikes is a good one, but the execution here is dreadful. Why do TfL continue to create new half-baked solutions to pre-solved problems? This whole junction is a mess and should be redesigned from scratch. “We will do things properly, or not at all” – Andrew Gilligan, breaker of promises. If this junction was designed properly for cycling, signs like this would be unnecessary. It’s strange that this sign has been put up at all really, considering that this is really the end of CS2 at present. Even if you manage to follow it you just end up in a bus lane. There’s no more blue paint beyond this point. But the craziest thing is that it’s not actually possible to legally follow the directions on the sign anyway. There’s no dropped kerb so you can’t join the shared use footpath on the left anyway. The only dropped kerb is at the crossing itself, where people are waiting on foot. If the traffic lights are red then you can make the manoeuvre, but then you’d technically be jumping the red light. It’s a very incoherent end to CS2. 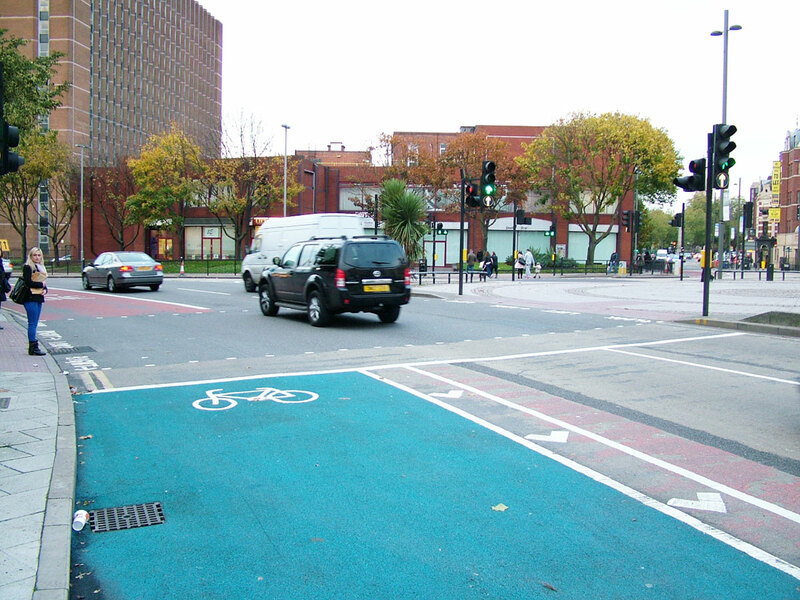 To continue along CS2, simply pull left onto the crossing where that woman is standing. “Super” eh? Even if you follow the sign, you just end up in this contraflow bus lane anyway. Note that there’s no room for a bus to safely overtake a bike here. This is not all abilities, 8 to 80 provision. The infrastructure westbound is pretty much the same as the eastbound side: a wide cycle path punctuated by poor quality bus stop bypasses and dangerous junctions. But TfL have saved something special for the final stretch, just before the still-deadly Bow junction. It must have been a Friday afternoon when they designed this bit. There’s several things wrong here. The first is the side-road treatment. Like the example in the previous post, the junction is dangerous. Despite there being plenty of space to take the cycle path away from the road here, it instead turns into a standard painted cycle lane. This is also the point at which the road widens to two lanes wide, so drivers aiming for the left-hand lane cut across the “Superhighway” to get to it. This leads me to our second problem. The entry to the bus stop bypass is at an uncomfortably sharp angle, again for no good reason. The side road is one-way so there’s plenty of room to play with. Also, because the segregating kerb ends so far back, when motor traffic is queuing they can (and do) block the entry to the bus stop bypass, so people riding bikes must either wait in traffic breathing in the fumes or try to squeeze up the side of the queuing vehicles. This new section of CS2 is certainly a step forward from the rest of the route, which is not only extremely unpleasant but so dangerous that it has been the scene of several deaths. And yet what has been learned from these deaths, nearly all of which have taken place at junctions? 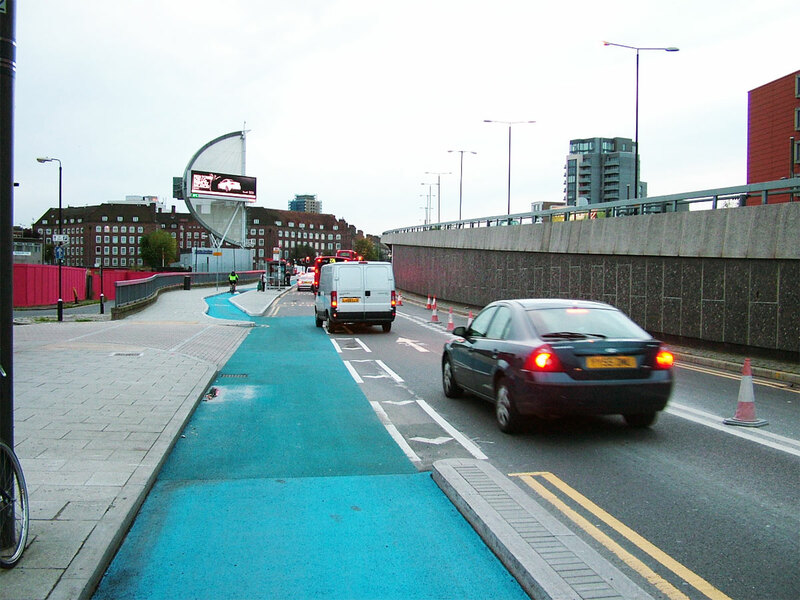 Seemingly nothing, as the junctions on the new segment of CS2 remain as deadly as those on the original section. Kerb separated cycle tracks make for a more pleasant journey along the straight bits, but it’s the junctions which are the most dangerous, yet TfL have made no improvements there. 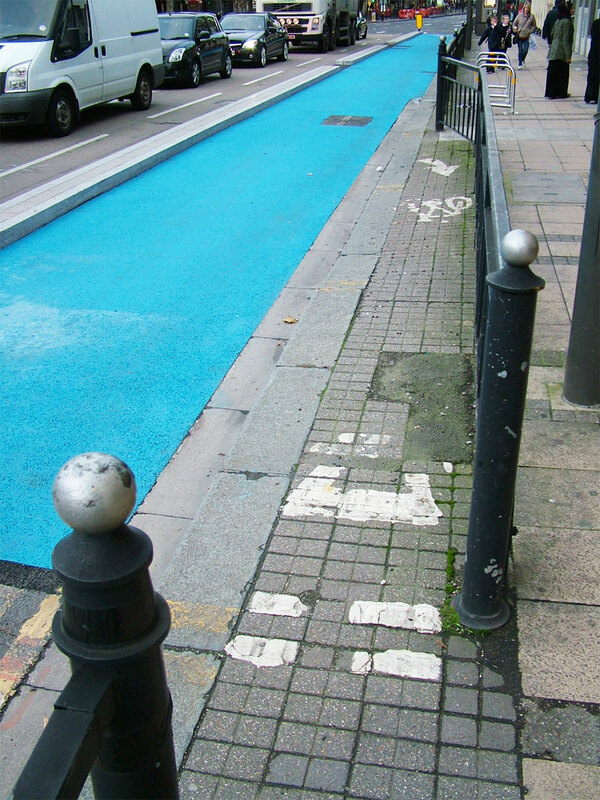 It’s been suggested that as this is TfL’s first ever segregated cycle track, we should be forgiving of mistakes made due to lack of experience. Sure, I’d be happy to forgive the odd small error, but this whole route is deeply flawed. TfL’s engineers are not little kids who deserve a pat on the head for making their first Lego house. They are grown men and women, highly qualified, paid tens of thousands of pounds each year. 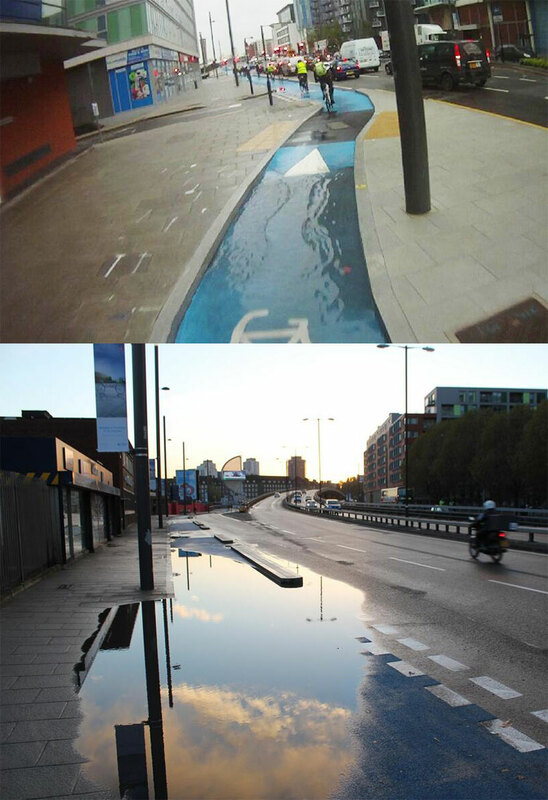 Sure we should praise TfL when they do stuff well, but the new CS2 is a third-rate cycling facility which is so poorly put together that it floods. What are they teaching highways engineers these days? Those responsible for this should already know what they’re doing. The learning curve should be shallow, not steep. It’s not difficult to learn about cycling infrastructure that works for everyone. There are British highways engineers out there who do know how to do this stuff properly, why weren’t they employed to do this? Or were there genuinely skilled people working on CS2 who were hamstrung by their bosses telling them to keep it cheap and keep the cars flowing? Can the London Cycling Campaign claim victory yet? 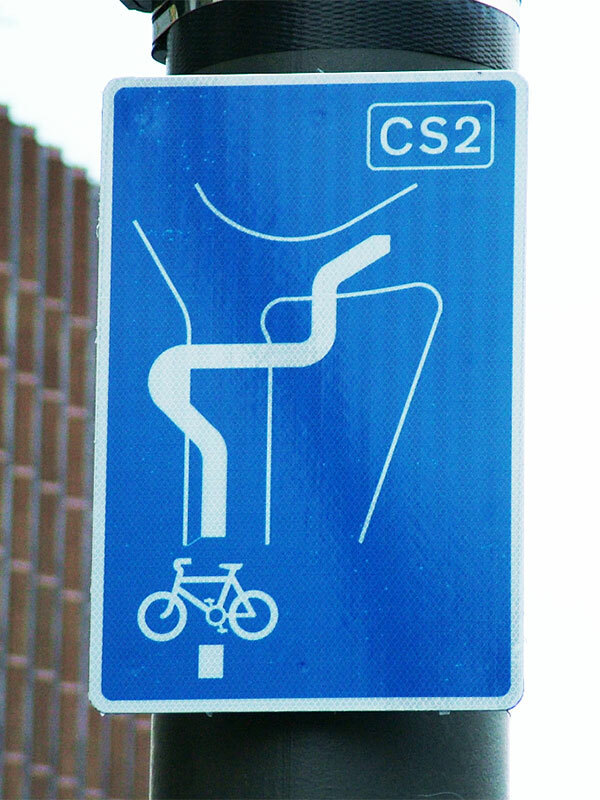 The LCC posted two articles about this new bit of CS2. The first post is an honest assessment of what the authors found when they visited at the end of October. They point out many of the flaws of the new route. The second post has a much more self-congratulatory tone, hailing this as a success of the LCC’s campaigning and protests. But I don’t think the LCC should be patting themselves on the back, at least not very hard. At the LCC’s 2013 AGM, a motion calling for “uniformity of provision and suitability for all ability groups” was passed by a huge majority. The purpose of this motion, as I understand it, was to finally kill off the bad-infrastructure-zombie known as the “dual network“. The flawed concept of the dual network has been hampering cycling design for far too long, and I’m glad to see another nail in its coffin. Surely this motion means that the LCC should only be crowing about facilities which are suitable for everyone? 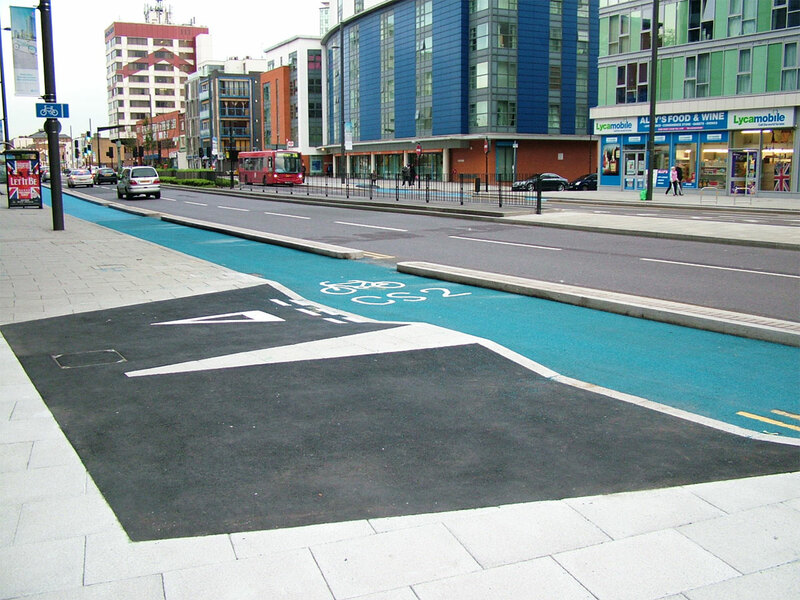 CS2 on Stratford High Street doesn’t meet these requirements. Not only are the junctions unsuitable for children, they’re also unsafe for confident cyclists. While I myself would always use the bus stop bypasses, flawed as they are, I witnessed several cyclists pull out onto the main carriageway to pass the bus stops, especially ones busy with waiting passengers, before pulling back in to the cycle path. So we’ve got a facility with bits that experienced, confident cyclists avoid using, and bits that are unsuitable for those unwilling to mix with heavy traffic. Motion 5 means that the LCC shouldn’t be crowing about this as a success, but demanding that the flaws are fixed immediately. This must have been fun to use! Well I guess we’re definitely progressing, albeit at a glacial pace. That’s a cool graphic tool you have by the way, to superimpose an imagineered solution on the dross which exists in reality. I liked the way it modified the bus stop bypass in this same area in one of your earlier posts on it. Looking at the 2 miles claim, it does seem to me that the Mayor’s press office and the PR people for TfL must have a placard above every desk reading “A Lie is half way around the world before the Truth has got its boots on” (in case you were wondering, that comes from Mark Twain, who clearly liked liar quotes, another famous one being the one about lies, damn lies, and statistics). I am trying to imagine how they found the necessary grain of truth to support this misleading claim, because I am absolutely sure that all those media outlets didn’t make it up, they took as gospel what they were told by TfL. Could it be that with one stretch being 0.7 miles and the other being 0.8 miles, both were closer to one mile than nil miles so by a process of rounding you call both one mile and then add them up? In any case, I have some favourites from the “terminological inexactitude” (© Winston S Churchill) department of TfL. In particular “51% of cyclists and van drivers who were aware of the trial [of motorcycles in bus lanes] approved of the measure”. Evidently this was the only way in which TfL could express a population of non-motorcyclists (who can be assumed to approve in any event) in which there was majority support. Certainly cyclists would not have provided a majority, and by the sound of it not enough car drivers to nudge the totals over. I suppose all we can do is keep on exposing these untruths and half-truths emanating from the Mayor’s office, in the hope that some people will take notice. Well it’s about 0.8 miles from Bow roundabout to Stratford junction, so if you include the non-segregated bit at the start with all the construction lorries turning across it (which the Mayor wasn’t photographed riding on, funnily enough) then both sides add up to 2 miles as near as dammit. But even if it was 2 miles long, that would be nothing to shout about. As you’ve pointed out, it seems that TfL are experts at spin! “It’s really not that difficult.” – then please please show me how it works on *genuinely* narrow streets, not just the expansive tarmac wastelands in your photos. I keep reading how it is possible on narrow streets but then even on “Dutch” blogs the only way it seems to work is to move all the traffic to completely different streets – good where possible, but surely very limited in most towns. Personally I’m happy to slow down behind a less confident cyclist on a narrower cycle path if that’s all there’s space for, rather than have nothing for that person. But cycle campaigning in this country seems to be in the grip of sporty cyclists who won’t accept anything less than going at 20mph. My experience of Holland is that basically everyone around town at a sedate pace, which I think is great. Don’t you think that you + LCC are giving engineers the perfect excuse not to tackle anywhere difficult. I don’t know why you’re being so snarky at me. I’m not actually the Department for Transport, you know. I have covered some ‘too narrow’ streets before: here and here, for example. But maybe they’re not narrow enough? If a road is too narrow for bikes then it’s too narrow for cars. We have to stop prioritising motor traffic everywhere. I don’t pretend that I always have the answers or that there will never be difficult decisions to make. But then I’m not paid a good wage to figure this stuff out either. Tell you what, you find me a narrow street and I’ll take a look at them. I suspect that there aren’t really any narrow streets, only narrow minds. I doubt you read about segregated cycle lanes being feasible on narrow streets, rather that narrow streets (indeed all residential or commercial streets which are destinations rather than routes) are dealt with through measures to ensure that they remain precisely that – destinations rather than routes. Rat runs are closed, so that fast through traffic can’t use them. That leaves locals, travelling the last few hundred metres, and not sh*tting on their own doorstep, so to speak. Julie, when I was in London a couple of weeks ago with my friend Peter, we rode together at much the same speed as we ride here in Assen. We overtook nearly everyone else. While the distance wasn’t great we thought we’d further. Our journeys took longer than expected because our average speed was far lower than would be normal over here. This is because in London you have to keep stopping and starting for the ludicrous number of traffic lights and other obstacles put in the way of cyclists while cycle-paths in Assen allow you to be able to keep going. It’s also far more difficult to ride side by side in London because of the need to keep looking over one’s shoulder. The threat of being mown down by a truck is somewhat unappealing, but the feeling that it may be about to happen is always there. Also because of the regular stops, cyclists end up needlessly bunched up meaning there was always a bit of scrum to get going again (added to by slow people insisting on positioning themselves at the front at traffic lights, meaning we then had to overtake them again). Stress levels for cyclists in London are certainly higher, but speeds are not. The odd sprint from one traffic light to another may be covered at a decent pace, but all that waiting around keeps the average speed very low..
One of the points you make is about the Dutch “moving all the traffic to completely different streets”. Actually that’s not quite what happens. Don’t underestimate the effect of getting rid of a lot of that motor traffic, as that is what has been achieved. When 40% of journeys in a city are by bike, which is not unusual given that 35% of all journeys under 5 miles of length in NL are by bike, that means an awful lot of the short journeys by car which most clog up city centres simply don’t occur. Motorists don’t need so many through roads when there are fewer of them. There are plenty of narrow streets in the Netherlands. These are places to restrict access by car. 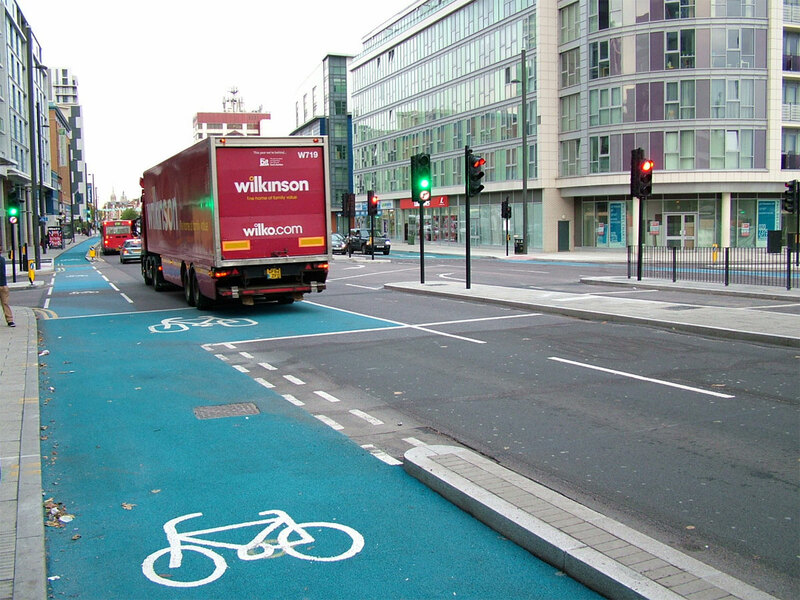 Unravelling cycling routes from driving routes makes it possible to get of the traffic lights. This not only gets rid of that stress and improves safety but also makes cycling convenient. Those traffic lights which delay cyclists so much in London are only necessary because of the insistence on making all roads through roads by car. Any city which genuinely chooses to design for cycling will achieve similar benefits. That’s exactly what needs to be done, and its perfectly possible, it just needs political will. My personal view is that road traffic needs to be reduced. If it were only politically possible to stop subsidising car use the way we do, then it would fall naturally as people realised they can’t in fact afford to drive as much as they do. A huge proportion of London car journeys are short and unnecessary, and could be undertaken by bike or even walking. But we’ve got ourselves in a cul-de-sac of car dependence breeding car dependence. To have any hope of reversing out of this particular dead-end we need a clear division of routes between through-routes and quiet side-streets, instead of trying to use every road for both fast through-traffic _and_ parking. At least I know what to expect when I finally haul my carcass over to Stratford. I will post about CS2X at some point, although you seem to have covered it! I didn’t cover all the bad bits, there’s plenty more to see if you go down there! There’s where the kerb disappears and turns into zig-zags at a crossing for no reason (which allows cops to park and block it). There’s also the disappearing blue at junctions, again for no reason. I’m sure there’s more I haven’t spotted, too. I think “TfL’s engineers are not little kids who deserve a pat on the head for making their first Lego house,” sums it up pretty damn well. Separating cyclists from motor vehicles and peds in time at junctions is a no-brainer. That the latest flagship scheme doesn’t do this is a disaster. Especially when it’s been done (CS3 on Cable Street, Waterloo St in Glasgow) elsewhere. The kerbing finishing where it is needed _most_ is inexcusable. Gilligan and Boris have run out of excuses. Thanks for the analysis. You’re quite right about there being plenty of existing, working examples of separating traffic modes in time. I can only assume that “smoothing traffic flow” came into play here and is worth more to TfL than people’s lives. At least we can laugh about it! Very funny indeed. Well written. On a more serious note, I think that if we are going to do it, then let’s do it; and if we are going to do it properly, then let’s do it properly. Thanks Simon! I completely agree, it’s no point doing this stuff if it’s not right. Good article. What I would like to know is whether TfL had any assistance from the Dutch Cycling Embassy? If not, why not and if so, did it take any notice? I would like to think that TfL would not be too proud to take advice from such a body but I fear that may not be the case. Watdabni: We’ve been running cycling study tours for many years longer than the Dutch Cycling Embassy has existed but TfL has never taken us up on it. It’s four months since the second time that I offered Boris a free study tour. No reply beyond dismissal from his team of public liaison officers. The previous offer didn’t even get that. Boris Johnson can find time to do things that are important to him. Finding out about how to build proper infrastructure for cycling is not important to him. David, I am pleased that you have tried – albeit without success. Of course it does not answer the question I posed but I suspect the answer to that would be the same. If it is, I wonder if there might be some way to make that public? I am beginning to think that only embarrassment will get movement on this issue. Er. Got any evidence for that? Doubting myself slightly I took the chance to go and walk the section from ~Abbey Lane to ~Cam Road while taking the bin out. I’ll be honest, I’m less sure what’s intended now. pedal cycle lane.’ signs are located (I had to look that up) though as I look at ‘Know Your Traffic Signs’ I can’t tell if that’s a mistaken assumption or not and flicking through the guidance on Tactile Pavements and even “Traffic Signs Regulations (Amendment) (No. 2) and General Directions (TSRGD) 2011, SI 3041” left me none the wiser but considerably more bored. Perhaps I’ll have to do less Vehicular Walking.